Making innovation deliver | The Forum Network, hosted by the OECD: Shape ideas. Shape policy. Shape the Future. Marking the centenary of the end of World War 1 a few weeks’ ago has given us all pause for reflection about the world we live in, the events that have shaped us, and our vision for the future. The Great War was a period of great strides in technology and scientific knowledge, bringing us significant human advances, including around medicine and healthcare, but also delivering wrenching horrors. Technology never stands still. The recent Paris Digital Week, with the Paris Peace Forum, the Internet Governance Forum and the GovTech Summit, zeroed in on the profound changes that digital technologies, in particular, are bringing to our economies and societies, and the global discussions that must take place to make the digital transformation a positive one for all our citizens. 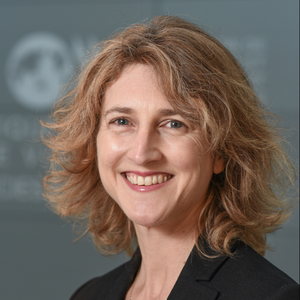 It’s timely therefore for leaders of the policy debates in our countries and organisations to step back and ask – are we doing all we can to ensure that innovation is bringing us a better world? Since 2000, the OECD’s gross expenditure on R&D has risen from 2.1% of GDP, to reach over 2.3% in 2016. In current PPP terms, that’s over 1.2 trillion USD spent on research and development efforts in the OECD area in 2016 alone. New actors have joined the global innovation scene. China’s R&D expenditure rose from 0. 9% of GDP in 2000 to 2.1% in 2016 – making China the second-largest performer of R&D, trailing only the United States. In the decade to 2016, India went from a standing start to having the 4th largest number globally of top-cited scientific publications related to machine learning – a key technology driving artificial intelligence (AI). We are seeing the benefits of these efforts. For instance, in the oil industry, camera-carrying robots inspect the interior of oil pipelines, looking for fissures, which are then analysed by AI to detect potential faults – helping avert environmental and human damage. Advances in remote sensing technologies are enabling farmers to tap increasingly precise data about soil, weather and environmental conditions, helping them to optimise production and use of fertilisers and pesticides. But despite all this innovation, our economies are experiencing a slowdown in productivity growth, a decline in business dynamism, and persistent divides between leading and lagging firms, and leading and lagging regions. There remains vast scope for firms to harness the opportunities of innovation. Many firms do not innovate and the majority of businesses conduct no R&D. Almost three-quarters of enterprises in the OECD with 10 or more employees were not using cloud computing in 2017. Big sectors of our economies – education, health, utilities such as water and electricity – still have very low digital intensity, thereby missing the potential gains in efficiency and service quality that data-driven innovation could bring. And within countries a small number of firms are responsible for a large proportion of total business R&D, with the top 200 companies globally accounting for about 70% of R&D expenditure and 60% of key patents in 2014. Spreading the benefits of innovation wider is immensely important. The OECD’s productivity nexus work showed that productivity divergence is intrinsically linked to wage divergence and inequality. And despite the fact that job creation remains positive, people are fearful that automation will destroy work as they know it. 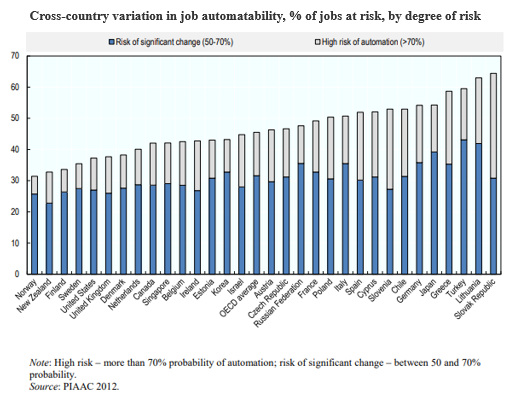 Around one in seven jobs in the OECD is estimated to be highly automatable, and right now, workers in jobs at highest risk are typically not those getting on-the-job training. There is a policy challenge for us all, to make innovation deliver on its promise of growth and well-being. But to make good policy, we must understand innovation today. The OECD’s new Science, Technology and Innovation Outlook underscores how the nature of innovation is changing, becoming more digital and more global, involving more stakeholders, and moving beyond traditional science and technology fields to encompass social and organisational innovations. Some policy choices will remain clear – such as framework conditions that foster investment in innovation, and favour openness to trade, robust competition and collaboration between firms, universities and research institutions. Some policy choices, however, must be reframed for this new innovation reality. We must account for the growing importance of data for innovation, the new business models it creates and the privacy and ethical issues it raises. We must debate how to spread the benefits of innovation wider, keep diffusion channels open and maintain a healthy market environment. And we must discuss how policies on tax and investment can strengthen the benefits of the digital transformation underway. 100 years ago a number of OECD member countries were emerging from the horrors of war, rebuilding their economies. Nevertheless, it was a time of optimism and the start of the second industrial revolution – Industry 2.0 – with machines running on electrical energy and the advent of assembly lines and mass production, and with it a new era of governance both domestically and internationally. We stand at a similar threshold today as the Internet of Things, cloud computing and AI reshape economies and societies, in turn forcing a rethink of our institutions, our policies and the ways we work together across countries. We need to ensure that this opportunity benefits our societies. The OECD is working hard to support countries in this endeavour, not least through its work on digital transformation, artificial intelligence and the future of work. Let’s all rise to the challenge. Thanks Sarah, perhaps only digitalization makes it possible to cope with all the huge problems now we are facing on the planet, from loss of biodiversity to explosion of human population, from toxic chemicals to plastics, ,...climate etc. Thanks Ahmad - yes, while digitalization may not solve everything, we do hope that savvy public policy can do much to harness the benefits of digital transformation and steer it towards the things that really matter for people's lives.